It’s Friday, time for Hortense Hoelove to once again answer readers' questions! I must quibble with you, Hortense, over that comment "Veggies Make A Garden Real." So what are shade gardens? Figments of the imagination? Illusory gardens? Am I imagining the plants grouped together, growing and blooming, providing scent, color & texture, shelter & food for critters? I hope you address this issue in your next post. What is there to quibble about? Veggies make a garden real because they address all five senses, including taste. They are complete in that regard. It does not mean that other gardens don’t exist, because they clearly do. 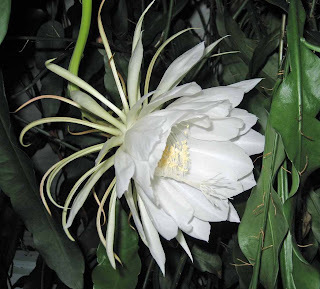 They grow, they flower, and sometimes they provide scent. They exist, but are they complete? I contend that to make a garden real, as in complete, there should be at least a vegetable plant or two, even in a separate pot in the only sun the garden may get. Then when you taste that vegetable, you will realize how real that garden is, because it addresses all five senses. 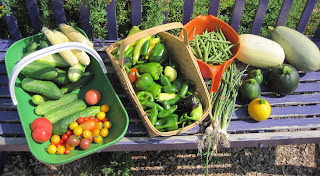 Vegetables harvested from a real garden earlier this summer. I saw a post about ordering spring flowering bulbs way back in July. Is it too late to order them now? Goodness no! As long as bulb companies haven’t run out of bulbs and it isn’t too late to plant (and they haven’t and it clearly isn’t), then it isn’t too late to order bulbs. But I wouldn’t put it off too much longer because some of the unusual bulbs and new varieties will soon be sold out, if they aren’t already sold out. I have noticed that some of the “power buyers” have been completing their orders, and I myself ordered most of the bulbs I want weeks ago. But I just thought of some more bulbs I’d like to plant so I’m going to order them this weekend. 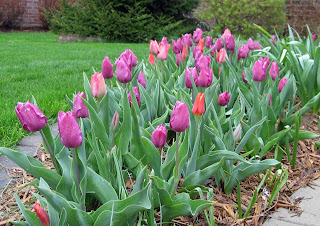 These bulbs will mostly just be regular ol’ tulips, so there should still be plenty available. But remember, last one to order ends up with those undersized bulbs sold in the big box stores! How many times should a gardener try a plant that always dies for her before she gives up? Though I have answered this question before, I am happy to answer it again because this is a far more complex question than many people realize and the answer depends on the circumstances. If the plant is growing just across the fence in the neighbor’s garden, never give up. You should politely ask the neighbor how he or she manages to grow that particular plant that is eluding you. Most gardeners will respond with, “Aw shucks, I don’t do anything special”. But don’t be fooled by that! If you can’t grow it and ten feet away, your neighbor can, then there is some secret to it and you have every right to find out what that secret is, by any means necessary. Start out by asking probing questions that require more than a “yes or no” answer. For example, don’t ask “do you fertilize that plant?” Ask, “what kind of fertilizer do you use and when do you apply it”? If the neighbor is tight-lipped and won’t give you answers, please contact me “off post”, and I’ll provide details on secret methods for getting information out of reluctant gardeners. But if you are trying to grow a plant that is clearly not suited to your climate or just doesn’t like the weather the year you try it, then the number of times you should try is inversely proportional to the cost of the plant. In other words, the cheaper the plant, the more times you should try to grow it! But always try at least once. Or twice. Maybe even three or four times. If you have a question for Hortense Hoelove, please let her know! Do you ever push the zone limit, if so, ever have luck with plants not for your zone? Ah, so the term "real" actually means "complete." With that I can agree. Even though I don't have a sunny space for a whole vegetable garden, I enjoy the produce from the plants in the pots on the patio. As for ordering bulbs, it is too late for those of us in the Midwest to order autumn flowering bulbs such as Colchicums and autumn Crocus. Those need to be ordered by July. Dear Hortense, Your answer to MMD was thoughtful. but I respectfully disagree that a flower garden can not be real because you can't taste it. Surely you have edible flowers in your place. I eat nasturtiums, and rose petal jelly is wonderfu,l as are the rose hips. I pick them right off my rugosas and eat them as I walk around admiring my day lilies, which when sauteed or made into tempura are quite delicious. Okay, a garden of hostas and foxglove and monk's hood would not be real by your most excellent definition. Oh dear, I am late as usual--I haven't even thought about ordering bulbs! Well, actually I've thought about it, but I haven't decided if I want to get as carried away as I did last year. But I'd better get some alliums ordered before all the Spring Flingers have bought them all!